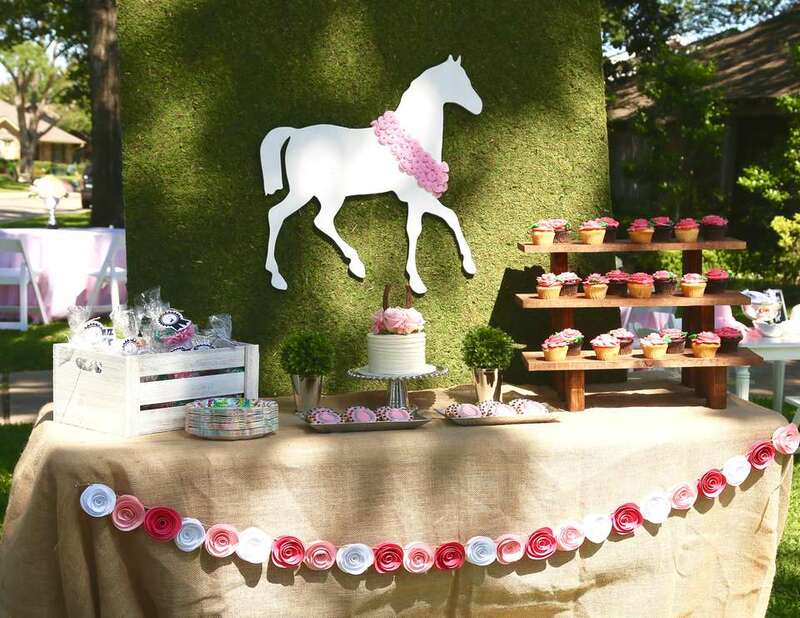 What better way to pair your daughter's 2nd birthday with the Kentucky Derby races than with a full blown Derby Day party!! 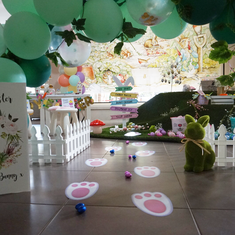 We had a blast working with Claire's mommy to put together this overall design that appealed to both the birthday girl and her guests as well as the adults. 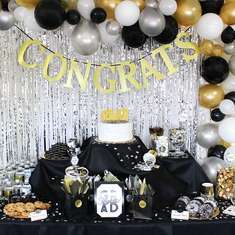 The centerpiece to our desserts table was definitely this custom backdrop from Created by Jackie. The 3D, hand-cut wooden horse was adorned with felt roses and mounted on a large scale moss covered backdrop. We selected a sweet white buttercream cake and topped it with a horseshoe and fresh pink flowers. Pink rose buttercream cupcakes were displayed on this rustic 3 tiered stand custom created for this project. Horseshoe cookies in our party's colors were displayed neatly on 2 silver trays in front of the cake. For a pop of color, we hung this handmade paper rose garland in front of the table and chose a bright floral pattern for our paper plates. 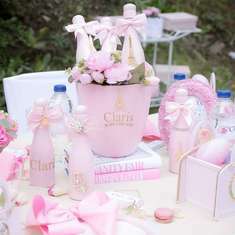 Seated tables for guests were covered in pink floor length linens. White paper placemats were added for subtle contrast and our centerpieces were beautiful white and pink flowers displayed in silver trophies; large for the adult tables and small for the children's tables. In addition to live ponies brought in for the event, the smallest guests were entertained at this "Decorate your Derby Hat" station. There were sweet hats for the girls and bow ties for the boys for dress up play. For the adults, this DIY betting board was created for placing bets prior to watching the race on the outdoor projection screen. Catered food was provided by Armando's. 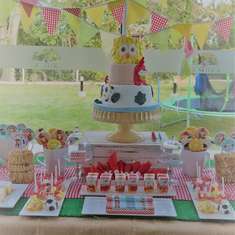 A Mint Julep station and attended bar was provided for the adults and a "Junior Julep" beverage station was set-up for the kiddos. These adorable ride-on ponies served double duty at the party; presents for the birthday girl and amazing front door decorations. This amazing life-sized standee from Shindigz set the stage for her birthday party...and were lucky enough to snap a photo of sweet Claire right before the party started. Mint Julep & "Junior Juleps"
Where did u get Durby white horse back drop? Hi! It was custom made by a local Houston vendor, Created by Jackie. Hello. Where are this cute "riding ponies" from at the front door?